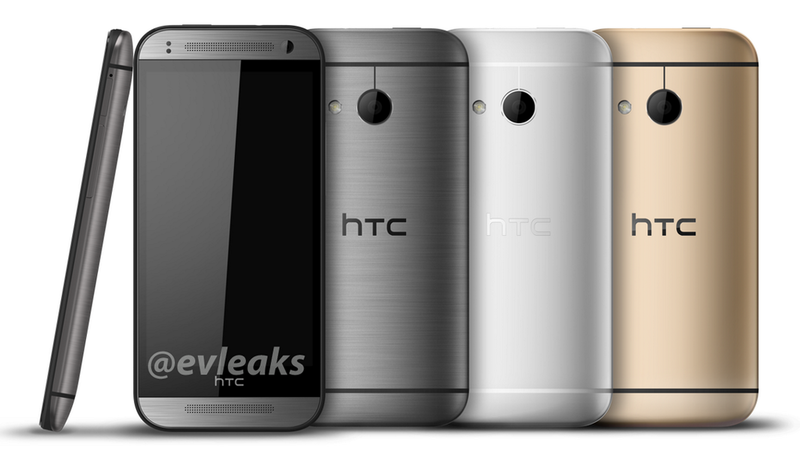 A photo showing the upcoming HTC One Mini 2 in multiple colors has been leaked on Twitter by @evleaks. 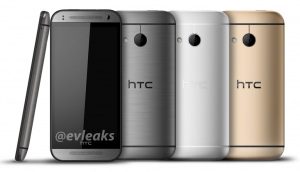 Just like the One M8–which was released earlier this year–the Mini 2 comes in a few colors, gunmetal, silver, and gold. Outside of a difference size and a couple of features, the Mini 2 looks very similar to the One M8. This means that for people who don’t like the M8’s size or price, the smaller version may be a worthy alternative. The only hardware-based features that aren’t in the One Mini 2–based upon the leaked photo– are dual flash and the Duo Camera. Since those features are avsent, the handset looks much more generic on the back and leaves out anything special, even though the Duo Camera is a big part of the One M8. Given the information that has been provided by the photo and other leaks, we already know that the One Mini 2 will feature a larger percentage of metal on its body than the previous version. Although we do not know how much metal will be included, the HTC One M8 went from 70 percent metal to 90 percent metal. With the exception of plastic around the smaller One Mini’s screen, it sounds like the increase in metal use will be similar. Adding more metal to the handset definitely worked for the One M8 by making it feel more premium and expensive, so it is likely that a similar change would be equally effective in the more budget-friendly One Mini 2. A Better One Mini 2 Camera? Since the One Mini 2 will not feature the Duo Camera feature that was found in both its predecessor and the new One M8, it is being reported that the sensor will be a more traditional 13-megapixels than the 4-UltraPixels sensor in the other handsets. Summary: A photo of the HTC One Mini 2 has been leaked. The photo shows the phone in three colors, including gold. The handset should launch in 2014.